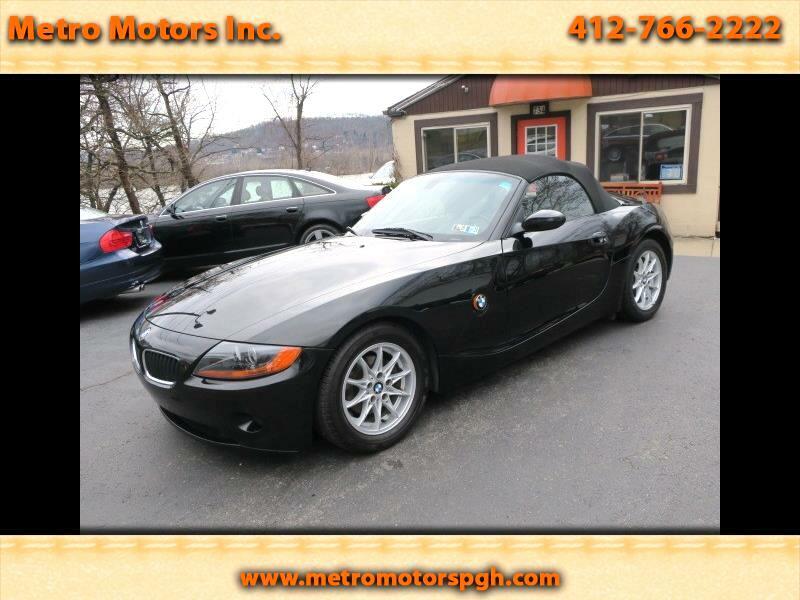 Used 2003 BMW Z4 2.5i for Sale in Pittsburgh PA 15202 Metro Motors Inc.
Pristine 2003 BMW Z 4 Sports Roadster. This garage kept under car cover Convertible looks nearly new! 66,782 Certified Miles!! Finished in Sapphire Black Pearl, Parchment Leather Interior. 1-Touch Disappearing Black Canvas convertible top with heated rear glass window. 2.5 Liter inline SIX, 5-Speed Manual Transmission. Power, Heated Seats. Tilt & Telescopic Leather Steering Wheel. Climate Control. Premium Sound w/CD. Automatic Headlamps. Stability and Traction Controls. Roll Over Protection. 16 Inch High Tread Tires on Alloy Sport Wheels. Owners Manual. Just Serviced, Inspected, Smog Tested. Clean Auto Check History Report on hand showing NO ACCIDENTS OR ISSUES!! Clean Low Mileage Z 4's are hard to find, and a solid investment in fun and resale value! A Pleasure to drive! !